Her racing name was Sweet Ambrosia, but now she's known simply as Asha - and at just 2 years old, it's almost a miracle that she's still alive. Asha had been forced to race six races with minor injuries, and her last race ended in disaster. 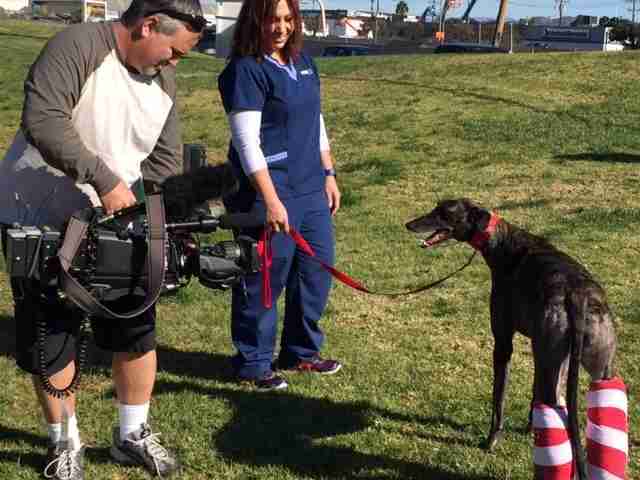 On December 21, after racing 41 times at the Caliente racetrack in Tijuana, Mexico, where many U.S.-born greyhounds race, Asha broke both her hind legs. Most greyhounds would have been euthanized after such severe injuries, but the Greyhound Adoption Center - which has been rescuing greyhounds from the racing industry for 28 years - invested the faith and funds in the idea that Asha still has a whole, loving life ahead of her. 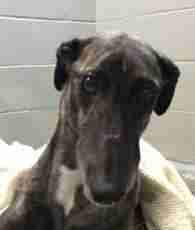 "When we picked her up, her back legs were puffed up like Jell-O, with significant bruising, and she was a little bit dazed," Darren Rigg, founder of the Greyhound Adoption Center, told the San Diego Union-Tribune. "But her personality was still so sweet. She just wins your heart." Asha went in for surgery last week to fix her legs - and all went well. 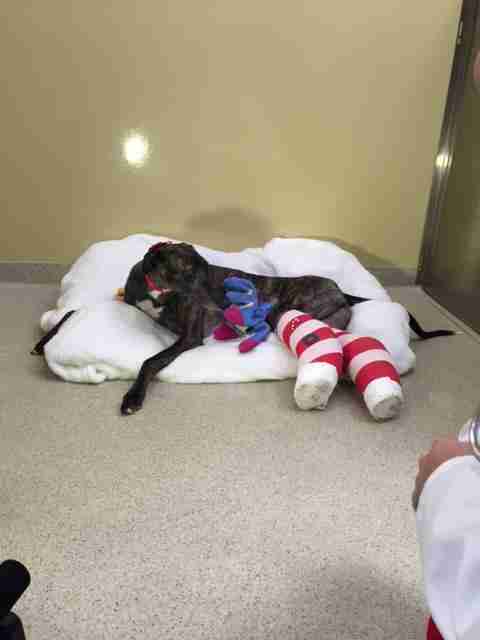 As she recovers over the next few months, she's sporting a pair of matching casts. 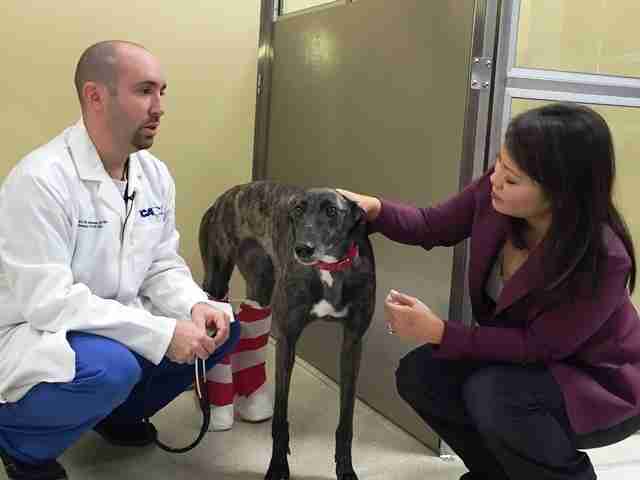 "Asha's rescue was the first time we used crowd funding to help raise funds for specialty medical care," Francie Murphy, spokesperson for the Greyhound Adoption Center, told The Dodo. "We depend entirely on donations to rescue about 150 greyhounds a year and place them in loving homes. Our group has rescued nearly 6,000 greyhounds and greyhound mixes since 1987." Greyhound racing is not fun and games for the racing dogs who are confined for about 20 hours a day and whose injuries too often are considered fatal. 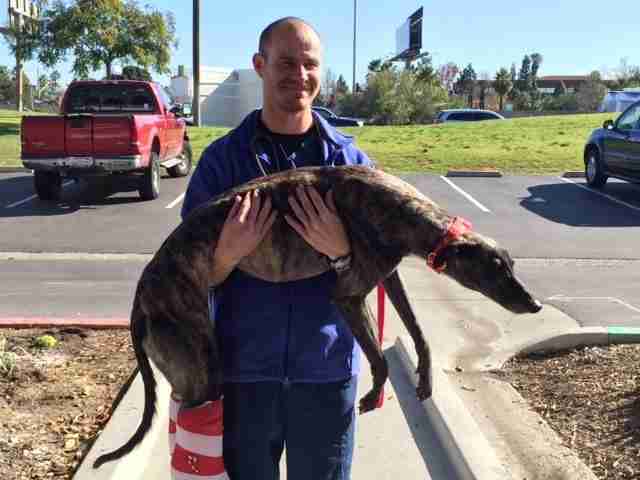 Click here to help rescued greyhounds like Asha. Learn more about how to help end greyhound racing here.